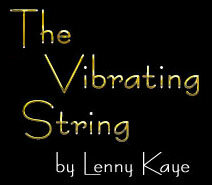 he vibrating string. The sound wave in motion, one of the most primitive means of measuring pitch. The vocal cord made manifest. The guitar is the preeminent instrument of the twentieth century, with a tail winding deep into the fossil record of musical millennia past, and a headstock looking curiously into the next hundred-year span. Museum enshrining-such as the exhibit at Boston's Museum of Fine Arts that prompted this book-implies an exaltation of where we've been. What better moment to bear witness to the splendor of the guitar as it continually relocates the music it will become? I'm no innocent bystander. I play the guitar, not an unusual calling in these times when most everybody knows a couple of chords, or knows somebody who does. The guitar is the parlor instrument of the past hundred years, replacing the piano in the living room and the neighborhood bar. It's about as simple as can be, and you can sing along. Or you can devote a lifetime to unraveling its intricacies. Something for everybody. It's a physical instrument, touch-sensitive, and responds equally well to gently caressing soft minor diminisheds in the moonlight, or being hacked against the frame of an amplifier hanging by a sway bar (see also whammy bar, wang bar, or tailpiece vibrato). It's portable. You can carry it anywhere (slung over one's shoulder in an old pillowcase is the accepted mode of transport in my neighborhood), and with the addition of even the smallest electronic gain booster, preferably soaked in tubes, it can be heard for miles around. You can play any kind of music on it. It lends itself equally well to the polyphonic classics as it does to basic chord-and-a-half rock, jazzbo comping, and country fried chickin-pickin'; and once electrified, it has a tonal palette unrivaled in expressiveness, that is, if you like fuzz tone, reverb, flanging, and tremolo. Clean or dirty. Mid-boost. Master volume. As the guitar flowed west from Europe-with a nudge from Africa and Asia-over the course of centuries to find lodging in the El Dorado that is America, the home of Messrs. Rickenbacher, Martin, Gibson, and the sainted Leo Fender (and Les Paul, the fulcrum upon which all these hollow- and solid-body visionaries balanced their evolutionary pickup ideas), it became nigh ubiquitous. Now, with the final chord feedbacking on the century-one that began with a people's instrument sold in the Sears, Roebuck catalog for five dollars and ended with the infinite possibilities of digital encoding-it's time to tune up. There is something fundamentally bass-ackwards about a museum exhibition of guitars. When instruments are removed from their function-i.e., sounding-we are constrained merely to look at objects that were meant to be heard. We can only imagine their tone, their sustain, the sound bouncing around the interior of a hollowed-out body or projected through magnetized poles into the electronic airstream. Aloud: that is how a guitar is meant to be perceived. And then there is touch. I can tell you that hardly anything feels more silky than the neck of a '57 Stratocaster, its varnish worn away by countless barre chords, the slight hollow where the palm cups the higher notes. It positively glows with the warm fibers of its wood, its striations and grains breathing. Read it geologically, like a rock formation worn by the wind, revealing strata, upheavals, sudden aftershocks, and the continual wear-and-tear of centuries. Guitars impart the personality of their players' skills the nicks and scars of their playing. Pete Townsend's smashed SG, the pick marks scraped along the guard. Chet Atkins's courteous, restrained Country Gentleman, which responds more to the filigree than to the flamboyance. Jimi Hendrix's upside-down Strat. B.B. King's Lucille. Truly, these are instruments meant to be held, if only in the imaginary music they make as they wait in readiness, the promise of melody and rhythm awaiting their performer. For those guitars whose owners aren't well known, or whose owners never play them, the visual appeal is still visceral. We slide slowly into matters of style here, musical genre but popular geometry, the arrangement of shapes and sizings and decorative touches that spotlight our given instant of culture. The hourglass figure, the quality of varnish, the inlay all capture the moment of the instrument's intersection with the newsreel; the scratch of a 78 record, the saturated Cinerama colors of a 1950s Bible movie, the dark gleam of a 1930s Gibson gamboled down a Mississippi crossroads at midnight, making its deal with the devil. Shape is fluid, within the reasonable bounds of what a guitar basically is. Start from the premise that you need a board on which to stretch the strings, a means to tune them and project them, only two hands (at the outer limits of which you invent the pedal steel, but they-musician and instrument-are a breed apart). The basic blueprint of the guitar is established. From there, it becomes a matter of custom shopping. A neck. Staggered frets, crosswise across the length to specify intonation, or fretless, like a violin, its nearest relation in the string-along clan. Any number of stings, really, though most guitars have half a dozen; the twelve-string a high-strung half-brother. Mario Maccaferri had a nine-string; Korn favors the seven-string. Tuning is a myriad of secret handshakes, but usually it's chord based, all the better to bend with a minimum of fingers, preparing to plant the rest in a nearby seventh. You don't choose a guitar; it chooses you, and shapes your playing-form follows function follows fashion. The music's silhouette is delineated and then customized by each player, involving and evolving. The birth of the blues. Rock and roll. Don't forget to wiggle it around, just a little bit; Jerry Lee Lewis made his entire eighty-eight-stringed instrument sound like a guitar in "Whole Lotta Shakin' Goin' On." And from the same '50s Sun studio, Scotty Moore gave the new music a swimming, echo echo repeats per second. The guitar made way for entire subculted languages, created its own ultrasound image, much as the well tempered clavier assisted Bach in his watch-like contrapuntal precision, or the smeared and pedaled piano allowed Debussy his liquid sense of dappled light and dark, his pedal steel. When someone asks me what kind of guitar to buy, I say the one that makes you want to pick it up. That you'll leave lying across the bed, on a chair, within easy reach. The one you'll keep playing. Plumage is important. The haze of a color, the adornment, the artisanship all play their part in a guitar's costuming, its character, its role. A decade or two down the line, the guitar that you bought new in a music store hanging on a rack with a dozen others (all of which were quite beguiling, thank you) will have opened up its resonance, stretched its wood in appreciation of the music that has been made, and accommodated all willing hands, or just yours alone. An instrument requires respect, give and take. You should get to know each other. The guitar is a family member, of the family Chordophone, and the following assemblage is a rare reunion. I can imagine the instruments in the Boston MFA exhibition climbing down from their displays after hours, gathering for a late-night shoot of the breeze, seeing what distant cousins have been up to, intermingling their music's. And because families help each other out, one will gift a lick to a relation struggling in some new clime, and a new music might get born. You never know. The guitar is a strummer's instrument: a strolling harp, the perfect tool for a wandering minstrel. In the heyday if the Renaissance lute, guitars began to mutate. By 1300, there existed a guitarra moresca, which resembled a lute, and a guitarra latina, a primitive antecedent more closely emphasizing the cinched waist and boned corset of the guitar torso. They'd met in Spain. You can see how intermarriage would produce such an offspring. For a while, the guitar was the prodigal, tumbling down the slippery slopes of class until it found root in the non-courtly orders. The curvature of its upper and lower bouts gave it a disconcerting sensuality that removed it from polite society. Life in back alleys and taverns simplified the instrument to its bare essentials, refined its basic uses. 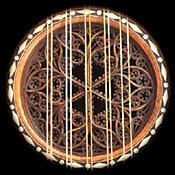 In the early 1600s, the chitarra was widespread enough to warrant Italian instruction books. Working its way back to the drawing room and concert stage during the 1800s, leaving the duende- the spirit-elf-of flamenco in its wake, the guitar stayed underfoot (better for dancing) in the roadhouses and the hills, until the folk boom of the 1960s. With the guitar-slingers of rock and roll, it became a social signifier, not only an instrument but an accepted lifestyle accessory and symbol of personal liberation. Once only a player in the orchestra, now it stepped out to lead the band. Took a spotlight solo. Made it big time. That's the short view. The long unfolds in the overlapping concentric orbits of each instrument's role as a go-between in the tacit trio that is player and music and listener. We have turned up the volume on the electric century. If there is a narrative to accompany this procession of stringed instruments, it is the guitar's journey to its amplification, its desire t be heard, and the musics created in its wake. The guitar is the only major instrument to be so transformed by a wall outlet and a pronged plug. It perches on the borderline separating sound generated from within and the ventriloquism projected through an out-of-body source, manipulating its character. The enhancement of acoustics began early in the 1920s and resulted in such wonders as the microphone, radio, and talkies. It would change the way singers sing and actors act. Les Paul remembers sitting in his Waukesha, Wisconsin, living room wondering how these relatively new technologies might be combined, jamming a phonograph record needle into the wood of his guitar and sending it through the wire-coiled magnet of a telephone mouthpiece into a radio speaker in hopes of generating an electron stream that might be embellished in amplitude and tone. Literally sculpting air. Early luthiers understood the vibration of the woods they filed and carved into shape. Each guitar was like an ecology, each piece harmonic. With a minimum of moving parts, the instrument was a tinker's dream, and even the simplest innovation could radically transform its sound and attack. When Christian Frederick Martin brought his art and craft from the Viennese workshop of Johann Staufer to America in 1833, he braced the soundboard of his instruments in the shape of an X. Thus strengthened, the guitar would eventually be able to accommodate the grander overtone tensionings of steel strings, instead of the gut or silver wire over silk that ran through the courses of European instruments. The ringing appealed to the industrial clamor of the new twentieth century. Orville Gibson also liked the clang of steel. He thought the guitar came up short compared with the sophistication of the violin. Working in a music store in Kalamazoo, Michigan, he combined what he felt were the violin's best design qualities into his mandolins, zithers, and harp guitars, arching the top of the instruments and eventually selling his patents to a consortium of investors in the early 1900s who took his designs to the mass guitar market. Gibson's arch vs. Martin's flat-top. The note swirled around the belly of one, spun like a centrifuge from the circulatory soundhole of the other, neck and inlaid neck through the first third of the century. The tone shapes within the outer shell of the instrument, molding a frequency of interior space, pumped through the body's soundhole-or in 1923, the arch top's scrolled f-holes-to awaiting ears. Now Eddie Lang didn't have to keep time on the banjo, and could chop and dice his comps on the big Gibson L-5; Martin's Dreadnought series would become a bluegrass standard. Not all sounds are burnished in the instrument's rib cage: there is the scrape of the pick striking the strings, the thump of the forearm as it hugs the guitar body, the hissing snake of the hip, and the ever-tapping foot. With the mirror-image twin streams of country blues-Charlie Patton, Willie McTell, Robert Johnson-and country string bands-Carter Family, Fields Ward and his Mountaineers, Gid Tanner and His Skillet Lickers-coming to prominence in the 1920s and 1930s, both driven by the guitar's sidekick accompaniment, and the blue yodeling figure of Jimmie Rogers perhaps straddling both, the instrument was well positioned to attack the flanks of the hit parade. But in the swing era, only western combos allowed the guitar a prominence; back East, where horns ruled the urban bandstand, the guitar's role was still essentially rhythmic. The great Gypsy guitarist Django Reinhardt brought a dapper flair to the instrument, perhaps one of the first crossovers plying a folk tradition into a more sophisticated Hot Club musicality (though even there, jazz was a little suspect). Along with Charlie Christian-who had just gotten one of the first amplifiers to trade solo fours with Benny Goodman's orchestra-Les Paul, Alvino Rey, and Merle Travis helped extend the instrument's wingspan through World War II, by which time Muddy Waters, Arthur "Guitar Boogie" Smith, Paul Burlison, and Link Wray were ready to plug in. When Bobby "Bill Parsons" Bare told the story of an "All-American Boy" in 1959-"Get yourself a gui-tar/Put it in tune/you'll be a-rockin' and a-rollin' soon"-he was heralding an explosion in the instrument's popularity. Funky chicken or cracked egg, the guitar launched the instant gratification of rock and roll, along with the magnetic attraction of a solid-body pulsing with its own electrocuting song, the hum and buzz of an axe turned up to Spinal Tap's "11." When does a guitar become something else? When is it not a guitar? Electricity opened a philosophical debate, that, regardless of which side you argued, inflamed passions to a seismic degree and drew a fault line that could have collapsed in on itself or changed the role of the instrument forever. The guitar was lucky. Unlike the harpsichord making way for the piano-forte (and what about the mellotron, not to mention synthesizers? ), its playing heritage-tunings, number of strings, and vast literature, from Fernando Sor to countless Appalachian ballads-meant the difference was more tonal and attitudinal. Guitars could continue to do what they did best: proliferate, evolve. The rush to electricity expanded the playing field, broadening the guitar's horizons, making it nigh indispensable. No longer confined to a subliminal supporting role within a band's momentum, it could be the undeniable focal point. But when the time came for the formal introduction of electricity, the source was unlikely: a small chain of archipelagoes as distant from the United States as America is wide, Hawaii. The acoustic lap steel is played with a bar in the neck hand, resting flat, and in the 1920s became a popular recording instrument via the island stylings of such as Frank Ferara and Sol Hoopii. Its wiry tone and melodic phrasing, with many slurs and vibratos, lent well to the acoustic horns that would capture sound before 1925, the year Bell Laboratories introduced their electrical recording process. The image of hulu maidens and beachfront sunsets didn't hurt. I am reminded of this gazing at the National Triolian in my corner, waiting for me to tickle its strings, which stretch over a conical diaphragm resonator, a virtual speaker in a completely metal guitar, painted bronze, with a palm tree stenciled on the back. Those were adventurous times. Ironically, the acoustic lap steel-tied as it was to an island vogue-faded, as electrical recording became the norm. But Adolph Rickenbacher had a manufacturing outlet that pressed National's steel bodies, and so came in contact with George Beauchamp, who had partnered John Dopyera at National and helped pioneer the resonator guitar. Beauchamp was still working on how to make the guitar louder when a disagreement with Dopyera moved him into partnership with Rickenbacher. Both saw a niche where they could apply George's ideas of doing away with the soundhole altogether. Out of the Frying Pan (his most famous creation, driven by pair of horseshoe-shaped magnets) and into the fire. Once amplifiers were onstage, it was a simple matter to adopt them to guitars, and the guitars themselves began to transform. Suddenly, the body of the guitar could look like anything. Practicality and comfort considerations led to a semi-standardized sense of how an electric guitar should appear, give or take a single or double cutaway, but Bo Diddley could play a square box, for all it mattered, and Valco (themselves big in the lap steel business, witness the mother-of-pearloid Supro) could make their Brentwood in the shape of the U.S. of A. In fiberglass, no less. The populuxe styling of the '50s replicated the Detroit tail fin and sense of roar that was America in mid-century. Leo Fender, in a southern California that was a custom car hotspot and future surfing Mecca, invented the Broadcaster in 1948, improving on it with the Telecaster and then the Stratocaster (the Jag-Stand would come much later), a template of American archetypes that now constitutes one of the great guitar lineages and has the surf music to prove it. Gibson saw its arch top demand fall off sharply after World War II. Though it matched Martin model for model in the flat-top acoustic field (Martin opted for the traditional-they never successfully went electric, though Bob Dylan certainly did), Gibson had promoted "electrical" arch-top guitars as early as 1936. Charlie Christian used an ES-150, and the bar pickup it featured is now nicknamed for him. Yet when Les Paul brought a homemade solid-body electric to Gibson in 1941, a pine plank on which he'd affixed two pickups and a bridge, surrounding it with pieces from an Epiphone guitar body to make it look less alien, they referred to it as a broomstick and passed. The company could hardly ignore the stir that Fender was creating. Already the Telecaster was influencing guitar phrasings; the bright, brittle sound could cut through drums and bass and the most unruly audiences. 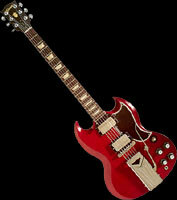 So in alliance with Les Paul, who by now had graduated to his own garage studio and the wonders of multitracking, Gibson designed a guitar with low-end authority and endless sustain, a slightly carved top to recall its violinistic inspirations, and gold finish, because "what other color?" It became the Les Paul in 1952 (make mine '59 and tiger-striped), and remains a fitting namesake for a man who was in the forefront of guitar invention. Regardless of which one reached the Pole first, "The Log" is arguably the first pure electric guitar. Adolph Rickenbacker (he'd hardened his name's spelling along the way) was not about to miss out on this frontier opened up for settlement. Even after he retired in the 1940s, his company continued their off-the-beaten-path explorations. They were a favorite with the new English bands, especially the Beatles' John Lennon, and they had a unique item with their electric twelve-string guitar, which would be anointed the mediator between folk and rock in the hands of Roger McGuinn of the Byrds, a band consciously formed as a link between the Beatles and Dylan. The '60s sparked the fuse to a guitar boom. A host of manufacturers rushed in to answer the skyrocketing demand. Some, like Epiphone and Kay, were older firms modernizing; others, like Guild or the later Mosrite (endorsed by the Ventures, an all-guitar band that taught many young guitarists their opening licks), adapted themselves to the times. Soon the sound of a painstakingly formed E chord was echoing from garages across the land. Luthiers became modern assembly-line factories, churning out literally millions of guitars. Though the sheer numbers gave the instrument a workaday, journeyman quality, it didn't necessarily mean any less emphasis on personality. If anything, guitar makers seemed only too anxious to indulge their most extravagant fantasies. Gibson flipped out and produced the Flying V and Explorer. Gretsch had been manufacturing guitars in Brooklyn since the 1930s, but their association with Chet Atkins in 1955 prompted a Nashville swivel for the company. They soon has the Tennessean and the Country Club models, though Gretsch's zenith would be reached with the exquisite White Falcon (we won't even mention the impossibly rare White Penguin), a six-stringed metal-flaked spangle of c&w fashion. There were individual high0end artisans crystallizing tradition, the exquisite arch tops of D'Angelico and D'Aquisto; and budget lines, with everybody's first guitar, a Silvertone built by the Danelectro company of Neptune, New Jersey, amp in the guitar case top. Guitars were sold in department stores, passed around and traded like good stories, had their own display in pawnshops. Pretty soon, as the '70s tolled their way to that ultimate in slash chord reductionism, punk rock, it seemed like every bed had a guitar stashed under it. Sometimes they'd be taken out and played every day; sometimes they'd be found years later, with the tags still on. I'm at a museum, very much like the one in Boston, only in a church basement on Manhattan's East 12th Street. It's semiannual guitar mart, but I'm not here to buy (well, maybe…). Here's a beaten-up Byrdland, thin-line, from the late '50s. I like the way the fingerboard comes to a point as it joins the body. Here's a Dan Armstrong, clear Lucite; its weight makes my arm sag. I note the full two-octave fingerboard, the way the pickups can be quick-changed at will. It's next to a first-generation Ampeg electric bass, with a scroll top reminiscent of the behemoth instrument it was designed to emulate. Ampeg: amplified peg, the pickup located in the floor-supporting rod. I see a Paisley Telecaster from the late '60s. An Asian ESP shredder from the mid-'80s, with its headstock filed to a stiletto, tremolo clamped at the nut so that you can literally droop the strings off the neck and then yank them back in tune for the next suspended chord. A 1919 Martin ooo-18 with later tuning pegs and steel strings, and a slight rub where the little finger of the picking hand anchors. A new Parker Fly. I can imagine each of their mating cries: the sitaresque D string drone; the blizzard of notes, two hands tapping on the neck; the slow ragtime fingerpick of pre-blues; the future's cybersonics. The people who play these musics and the music as it plays on them. To immerse oneself in the guitar is to experience the panorama of our collective musical memory. As for older instruments, highly individualized products of someone's acoustical imagination, this is as close as we'll get to reliving what they might have sounded like, pre-recording. Some are to fragile to string to pitch; we may not be able to revel in Antonio Stradivari's 1700 five-course guitar at standard A440, but we can try to fathom its voice by reading its rings, like the tree it once was. The young'uns count off down the street in an hour. Catch them if you can. The remarkable thing is that more than half a millennium of progress hasn't altered our conception of what a guitar can mean. Distorted by a vacuum tube or lightly brushed in a late-night bedroom, the guitar accommodates change without altering its basic nature; this is what gives these varied instruments their lifeline. No matter who picks it up when, the guitar will play the same song.